Cut pieces for the bottom plum stripe. Cut the lining for the bottom plum stripe and begun sewing the pieces. Finished sewing the plum and began seaming the white lining. Finished seaming the lining and attached it to the plum wool. 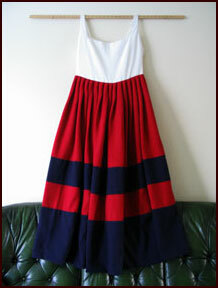 Seamed the narrow plum and red stripes. Ripped the seam finishes on the wide plum stripe and sewed them down again. Attached the narrow red and plum stripes. It took about 5 hours to do that one long seam. Sewed the narrow red stripe to the wide plum stripe. Seamed two parts of the top part the skirt. The third part was still wet, so I couldn't sew that. Finished the top part the skirt. Began sewing the final horizontal seam of the skirt. Continued sewing the final horizontal seam of the skirt. Finished the last horizontal seam of the skirt and sewed the lining to the wide plum stripe. With Dorothea's help made the pattern for the bodice and cut out the lining. Cut out the top layer of the bodice and began sewing the front piece. Finished sewing the front piece. Eylets, and lots of them. Finished the bodice and attached the skirt to it. Sewed the final skirt seam. 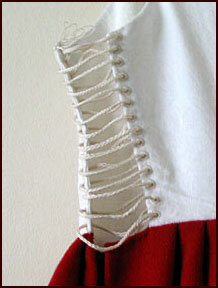 I am this close to finishing the kirtle! It is wearable as it is and I may not do anything to it until after Raglan; but I want to put a lining to the narrow plum band, an enforcement strip to the waist and shorten the shoulder straps. When all that will happen remains to be seen. Fingerlooped a string for the lacing. Fixed the front waistline. 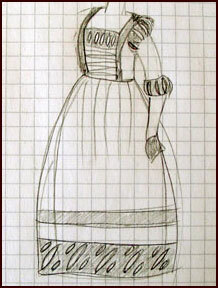 I discovered that it was too low while trying on the doublet, the rest will stay as it is.